Beef and Lamb Masala Recipe. Secret recipe from the old-time Chefs of Malay wedding specialty. Place 2 pounds stew meat into oven. Add 3 tablespoons grated ginger and the masala sauce. Mix together and bake in 350 degree oven for 45 minutes. Check occasionally and add a little water to keep meat moist. Garnish top with chopped coriander. Heat oil in saucepan. Add onion and cook until dark brown, not burned. Add garlic. In food processor, blend tomatoes and yogurt together. Combine spices. Add to onion mixture and cook 2 minutes, then add tomatoes and yogurt and stir. Puree all ingredients in food processor. Add salt to taste. Makes 1 quart. To make the masala powder: Grind the bay leaves, cinnamon, cardamom, cloves, fennel seeds and peppercorns in a spice grinder until mixture is a fine powder. Place the beef cubes, masala powder, 2 cups chopped onion, green chiles, grated fresh ginger, garlic and turmeric in a large, heavy pot. Add water to cover (about 1 cup) and bring to a boil. Reduce heat and simmer for 30 minutes until beef is cooked through. Add salt. Stir and continue to simmer about 10 minutes or until mixture is almost dry, but do not allow it to burn (add a bit more water, if necessary). Set aside. Heat oil in a large skillet over medium-high heat. Add mustard seeds and cook until they begin to pop. Immediately add remaining 1 cup chopped onion and stir over medium heat until onions soften and begin to brown, about 10 to 12 minutes. Add curry leaves and cook until brown, about 3 minutes. Stir in the beef mixture, black pepper, and lemon juice. Cook until nicely browned and heated through, about 8 minutes. 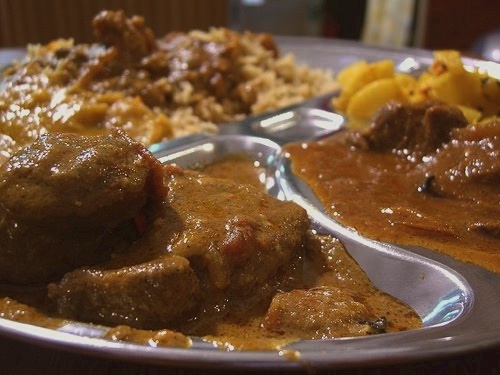 masala kambing rusuk! power tu! Gonna try this in the weekend together with nasi minyak and ayam masak merah… hope to invite a few friends over and crossing my fingers they’ll like it 🙂 Thanks for sharing! Lovely blog and gave me lots of menu ideas. These were excellent! Very easy to make & my whole family loved them! Thanks for sharing!